With more than 55 years of experience in industrial thermoplastics, Chemtrol offers dependable products that work in the most demanding environments. The premium line of quality Chemtrol valves are lightweight, corrosion-resistant, and maintenance-free - saving you time and money. The True Union Ball Valves so revolutionized the industrial plastic valve industry that they have become the standard followed by all major manufacturers. The purpose of the design is to permit the valve cartridge, i.e., the body containing all operational components, to be easily lifted from the piping system for servicing/replacement when the union nuts are backed off. Easy repair/replacement interchangeability, distribution availability, technical service, and reliable quality are the synergistic rationale many plants and original equipment manufacturers have embraced while standardizing on Chemtrol True Union Ball and Check Valves. The laying length of the body and the heavy-duty modified-acme threads in the union connections to the body have not changed in the four distinct models' 40 year history of the valve. This permits fouled valve replacement with a new body cartridge, which will fit the old union nuts. No change in piping length is required. The distinctive orange handle indicates "open/close" and direction of flow at a distance. Molded-in arrows on top of the handle dictate rotational direction to personnel for easy operation within 90 degree stops. For applications requiring handle removal, the D-ring stem flats indicate "open/close" and a molded-in arrow on top of the stem indicates flow direction. The original True Union Model A design had a seat-carrier that slid into the smooth bore of the valve body, held in place by the external nut and end connector. Tightening the external nut adjusted the compression of the PTFE seat onto the ball. 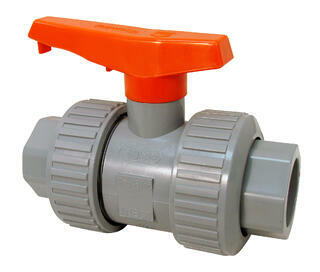 The first major evolution to the True Union Ball Valve, Model B, introduced the Tru-Bloc concept, a functional safety feature. With this design a separate threaded retainer locked the seat-carrier into the body and prevented the seat-carrier from being extruded out of the valve body when the external nut was removed. This change is intended to prevent pressure on the other side of the valve from ejecting the internal components and fluid medium out of the open valve end and to further prevent possible injury to persons or property. The Model C seat-carrier design was modified to include and external thread which mated into the valve body threads, eliminating the separate retainer. This modification also eliminated the adjustment of the seat-carrier by the external nut and end connector, resulting in a sealing envelope that was independent of external forces. An energized O-ring was added under the PTFE seat that provided automatic adjustment to compensate for seat wear. This design modification continued the Tru-Bloc feature, preventing the seat carrier from being extruded out of the valve body when the external valve nut was removed. The current Model D (manufactured in PVC and CPVC through 2") ball valve's seat-carrier internal threads and the external union nut threads were strengthened to provide an increased pressure rating of 250 psi at 73 degrees Fahrenheit and design was modified to provide wrench flats. The union nut OD was changed to provide improved gripping for strap wrenches. The Model D design continued the sealing envelope that was independent of external forces with an energized O-ring under the PTFE seat that provided automatic adjustment to compensate for seat wear. The Tru-Bloc feature was also retained. For more information on True Union Ball Valves, visit our website at www.nibco.com or contact a sales representative near you!